As I left the bottom of the hand, the southern most part of Michigan and headed north to the fingertips, it started to rain…again, but at least it was a quick drive, maybe four hours with stops. Luckily the rain cleared up by the time I arrived in Mackinaw City, and set up my tent at the Mackinaw City KOA. The minute I saw our tent site, I wished that I could stay for more than just one night, and my experience in the area, though it was short, has the gears grinding in my head with plans to return as soon as I can. The couple that ran the KOA were very nice to my dog Chico, real dog lovers. Though there is incredible hiking all over the area, I decided to take a Ferry to Mackinac Island as I hadn’t been there since I was a kid, and love it there. Not only are dogs allowed on the ferry, but Chico was allowed on the shuttle to the ferry docks– there is plenty of parking by the docks, but I wanted someone else to drive 🙂 At the docks so many different ferry employees came and asked to pet Chico, including one woman whose dog had passed away a couple months ago. I know some people hate other people petting their dogs, but this woman was so thankful, and obviously cheered up by Chico, and to me, that is what dogs are for, to make people happy. Other dock employees encouraged her to do so, and I could tell that there is a real family atmosphere going on. 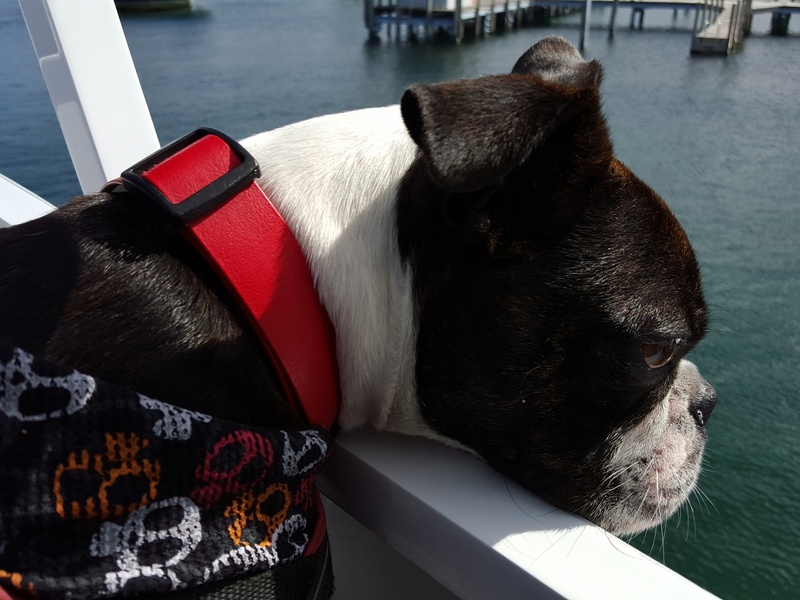 Chico looking over the edge of the ferry. 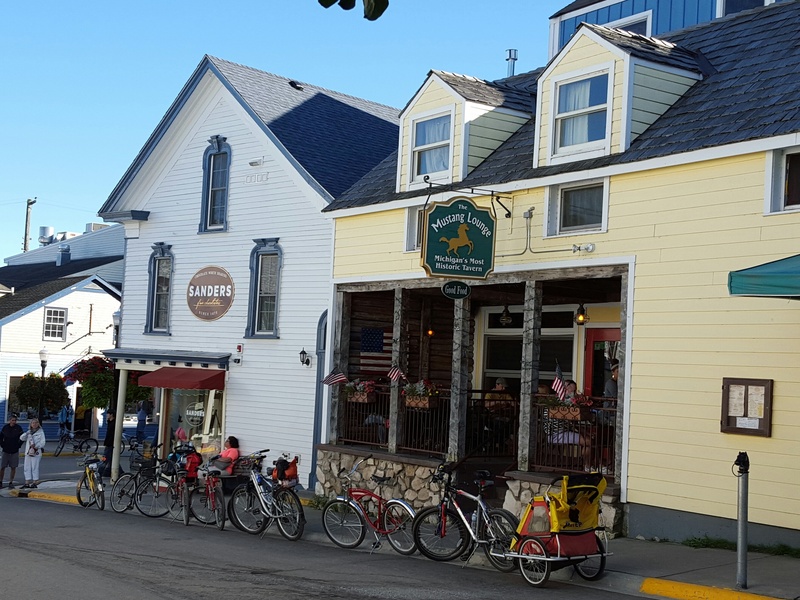 Oh, if you didn’t know, The entire Island is listed as a National Historic Landmark, autos are not allowed on Mackinac Island, transportation modes are walking, biking, and horses. The Island has a very interesting history, originally settled by Native Americans, the first European exploration was in the 17th century, two battles of 1812 were fought here, and it was a huge trading post before becoming a tourist and summer destination in the 19th century. The Grand Hotel is probably it’s most famous building, I didn’t get a photo of it, but besides the many images of it online, you can see it in the movie, “Somewhere in Time.” I only took a couple photos of all the gorgeous houses and hotels, I know, lame. 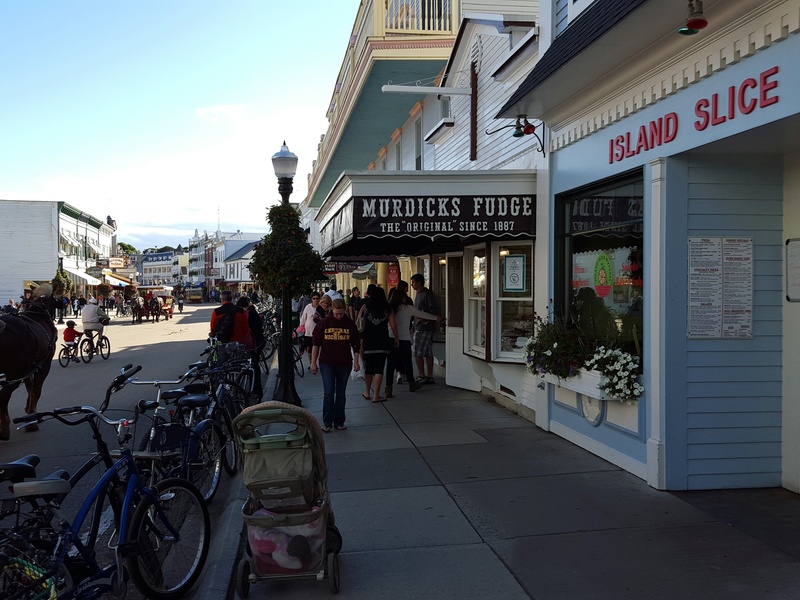 Fudge is Mackinac Island’s most famous commodity, yum! 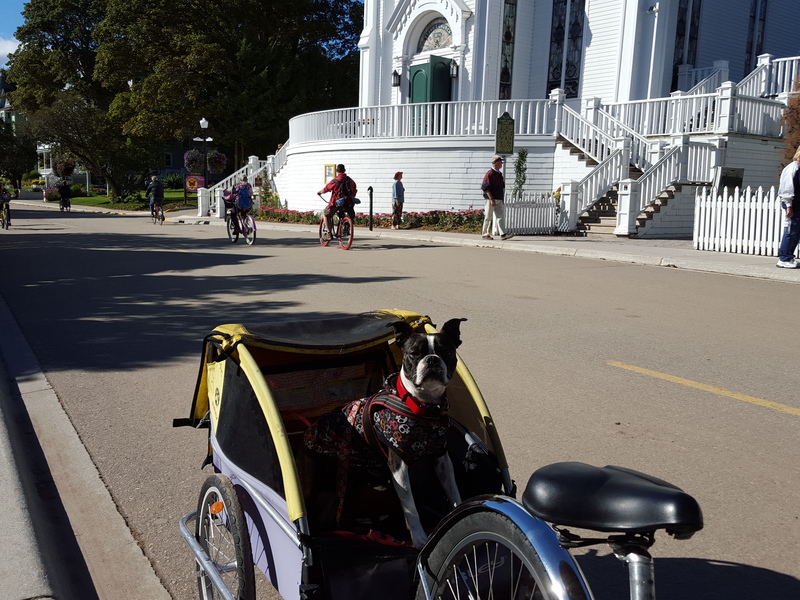 Dogs are allowed on the patios and porches of several places on Mackinac Island, and in some stores too! 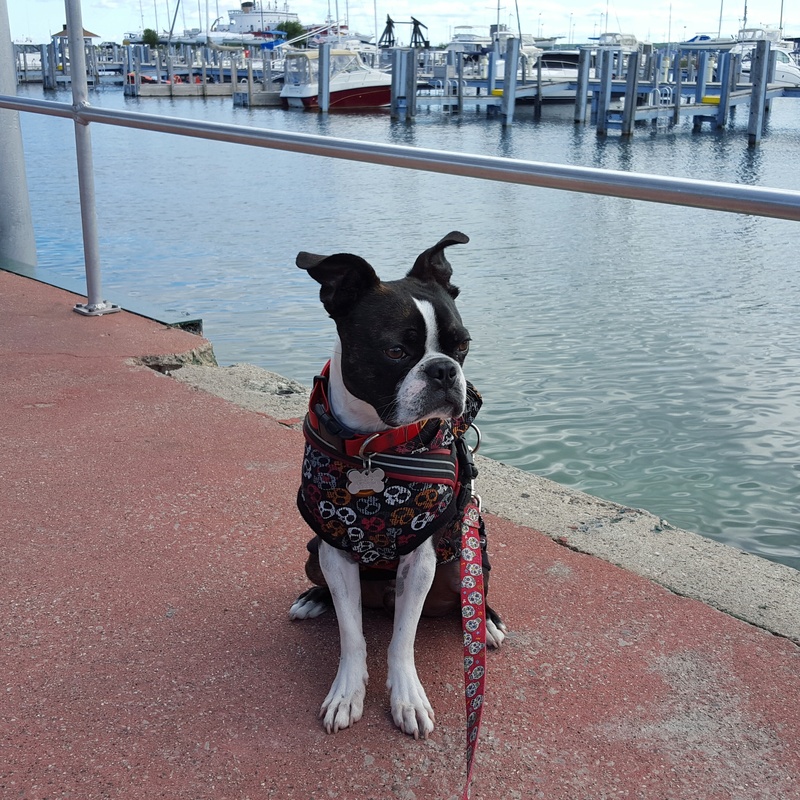 We even ran into one couple with three Boston Terriers! There were dogs of all sizes, and everyone was so well behaved! 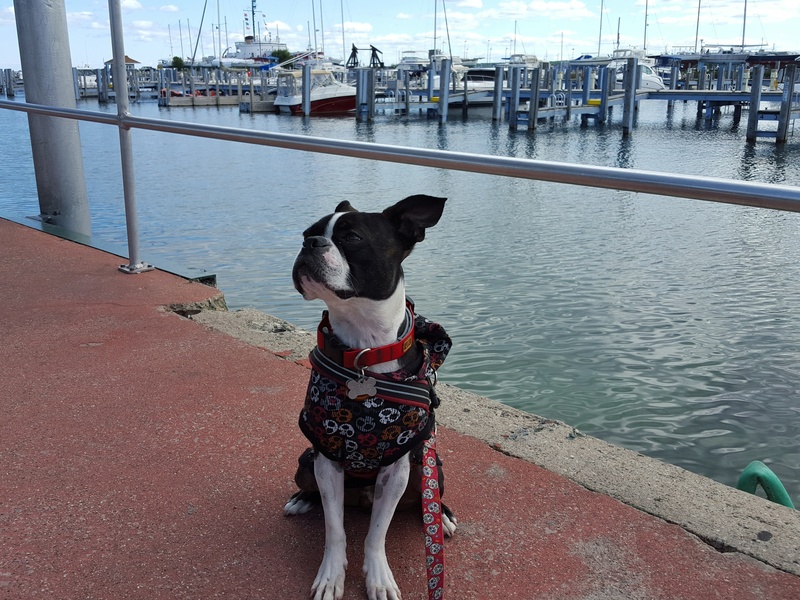 From what I’ve read, many hotels on the island allow dogs. The three Boston Terriers were on the porch of this bar. 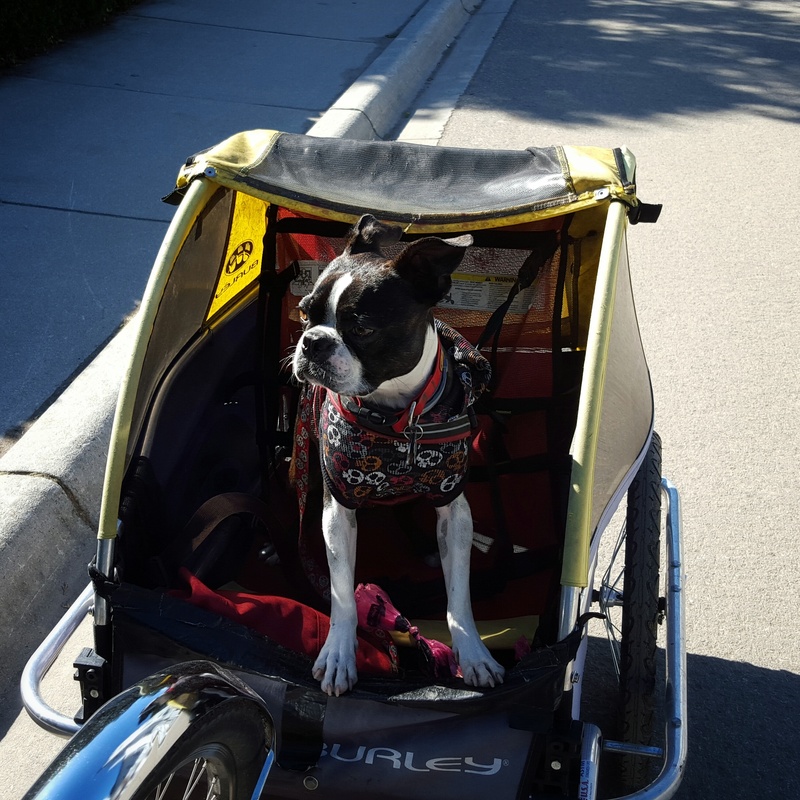 We also rented a bike, and they had special carts just for dogs! Chico wasn’t exactly a fan of being in the cart, he sang to me almost the whole time. 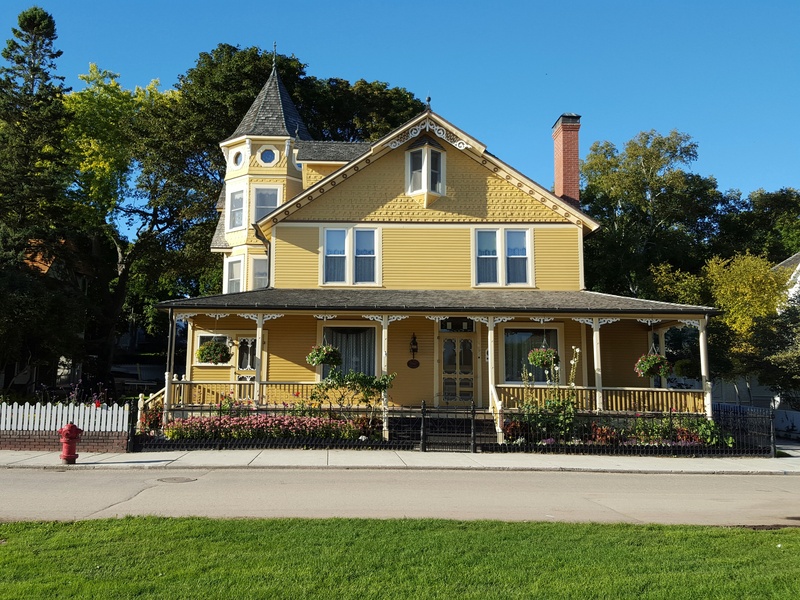 I was sad we didn’t have more time to spend on the Island, there are many hiking opportunities on Mackinac Island that I would love to explore in the future. We only had an afternoon. The ride back on the Ferry was so cold! Who’d have thunk that summer really did end the week after Labor Day! 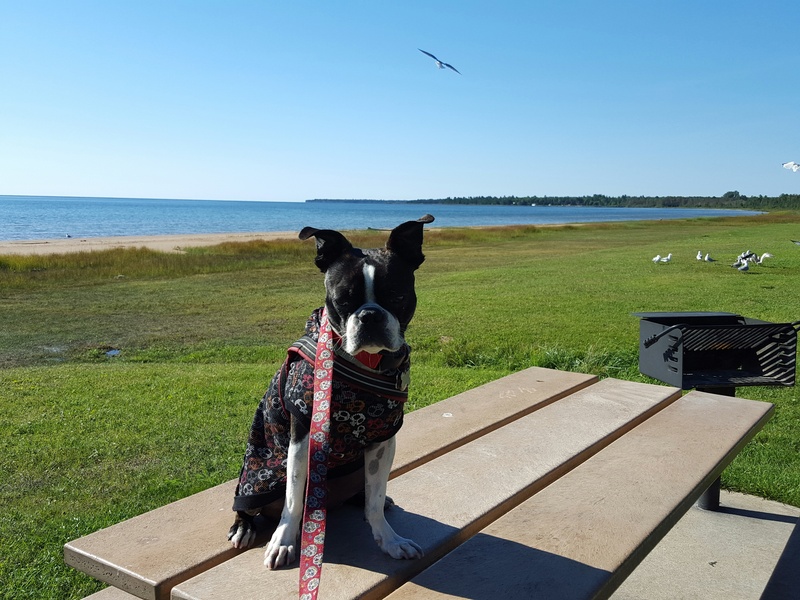 The Mackinaw City KOA was really great for dogs, they had 2 Kamp K9s side by side, and their own little nature trail, that is mostly a dirt path and about a mile long, and goes into town. 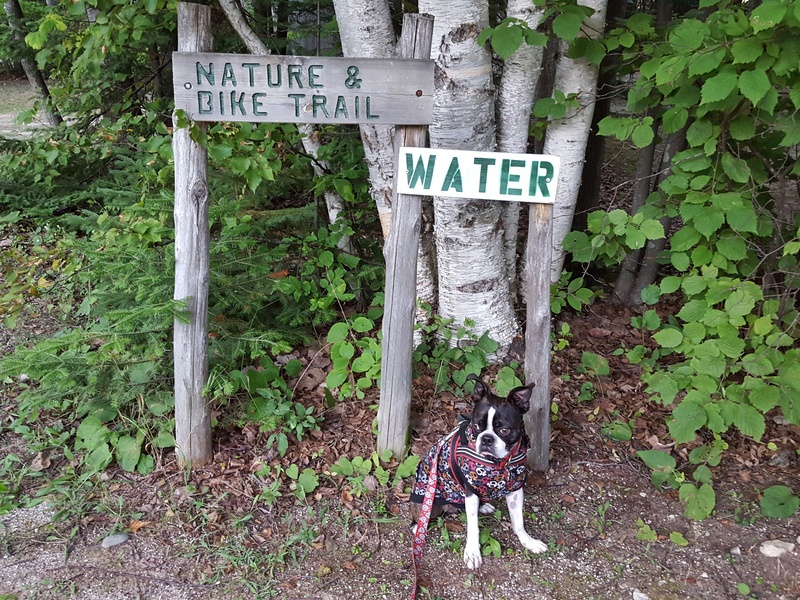 Also, the roadways around Maickaw City, and in the Upper Peninsula along the 2 had what they called “Roadside Parks.” These were parks with a view of the water, plenty of parking, picnic tables, and one room bathrooms that lock–none of them said no dogs allowed, so I brought Chico in with me. Roadside Park along the 2. 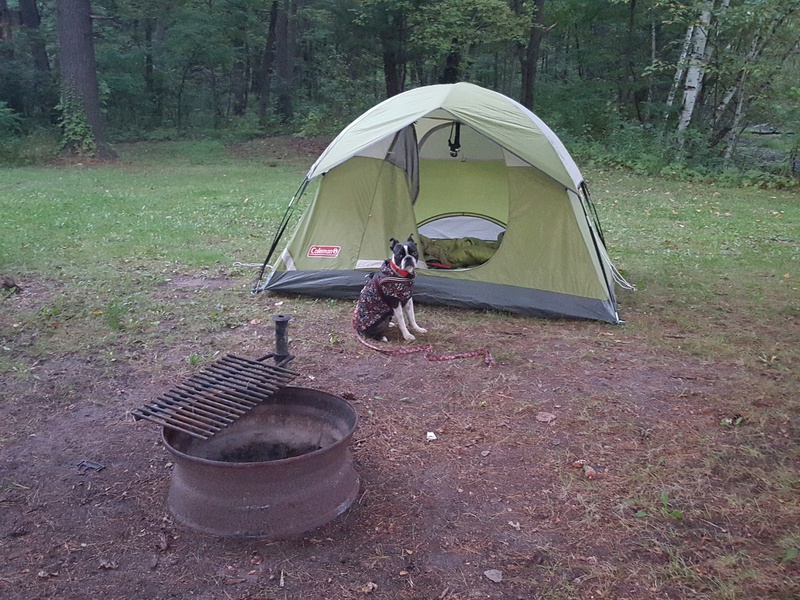 Our next stop was just a quick night in Wisconsin, google maps took us down all incredibly beautiful back roads In Northern Wisconsin to get to a KOA near the 90, which was right next to the freeway and the loudest KOA I have stayed at, but the actual campground was really nice. 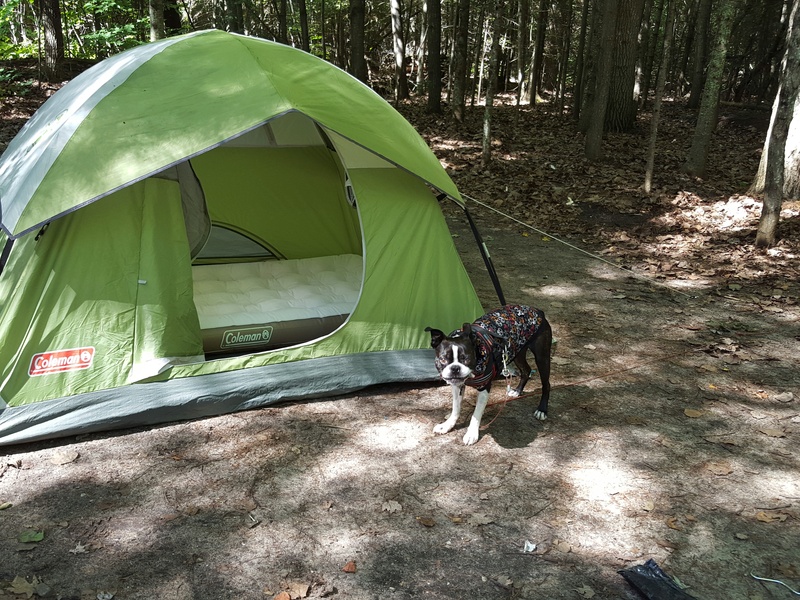 Chico did the oddest thing here, well only odd cuz he is about the farthest from his wolf roots as can be, yet at night when I brought him in the tent, he insisted on going back outside even though he had done his business. 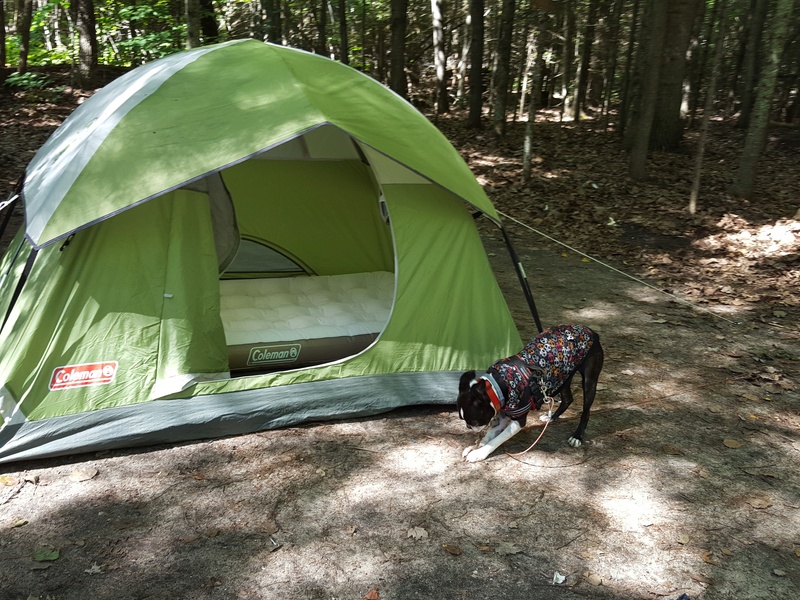 We were on leash, but he led me in a circle around the tent, and he marked it every 5 feet or so, and then he relaxed when we got back in the tent, and promptly went to sleep. There are some coyotes in this area, so maybe that is who he was trying to warn away lol. We had some time to kill here and drove to a small lake to hike around it, and I was surprised to find Toxic Algae warnings for dogs here too. In the morning when we packed up, I had my first real conversation with an actual stranger, by real, I mean more than small talk. He had set up in the middle of the night, and was comparing how fast we both broke camp in the morning lol. He was also driving across country, from New York to California, and told me some areas that I should really try to see, like The Badlands and Black Hills. I don’t talk to a lot of strangers when I am hiking or camping, as a matter of safety, but, he was cool and not creepy, and looked like someone who would be a part of my odd eclectic circle back home. It’s Not an Adventure if Everything Goes as Planned! Taking the plunge-Our first car camping trip! 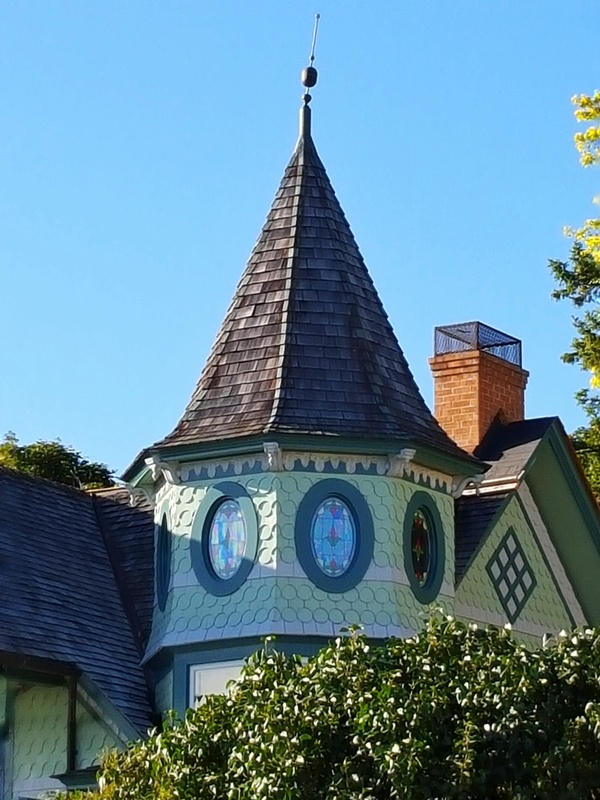 Across the country, and on a budget.